Maison Lévy designs decoration objects inspired by original paintings. 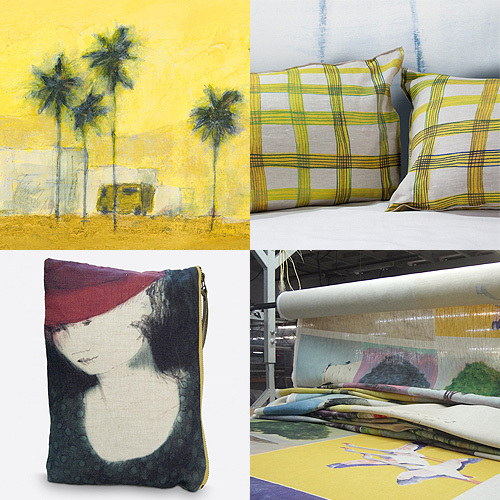 Their collections are an invitation to escapism and wish to include art in our daily life. Founded in 2006 by Geneviève Lévy and her daughter Nina Bonomo, the family company has grown through different artistic collaborations: with the painter Haby Bonomo first, whose work has been the inspiration of the project, and then with various artists as Martin Reyna or the italian illustrator Manuele Fior. For several years now, Nina, in charge of the artistic direction, uses her pencils to express her vision of the world and textile. With Genevieve, it is by using their complementarity of experiences and characters, that they are always eager to take up any challenge and renew the imagination of their collections.